For a perfect example about how 24/7 news coverage of the industry can result in molehills rapidly becoming mountains, look no further than a showdown between Epic Games and Naughty Dog in our very own March Mayhem '10. It's no secret that rumors become "facts" very quickly in this age of 24/7 gaming news coverage-and-blogging. A quick rumor about how Nintendo's next console will use a chihuahua as a controller gets picked up on one site, then another, and by the time you wake up in the morning it's accepted as fact on the internet that Nintendo has a secret factory down in Tijuana churning the puppies out. Now here's a silly little story that perfectly demonstrates just how easily things can get blown out of whack. In the current round of our March Mayhem Developers' Showdown, we have a very close race going between Epic Games and Naughty Dog. Now, as we encourage fans to get involved, so do we encourage developers to rally their bases. This story starts (as so many do) via Twitter, as the official Naughty Dog Twitter sounded the call to arms, urging its fans to come support the acclaimed Uncharted 2 studio over the opposition. This call was opposed by Epic frontman Cliff(y B)leszinski, who Tweeted about the competition and then offered a challenge of his own calling the other company out: "@Naughty_Dog YOU'RE GOING DOWN! IT'S ON!" Said "call out" was, of course, all in good fun - both developers have made it more than clear how much they respect and enjoy the others' work, and it was about a (totally awesome) popularity tournament, nothing more. But then, Bleszinksi's Tweet was picked up on VG Arabia as a legitimate calling out, and clear evidence that Epic's Gears of War 3 was looking to take a chainsaw-gun to Nathan Drake and curbstomp him. To their credit, the folks at VG Arabia did realize their mistake - but not before the news story was one of the hottest-rated top stories on N4G.com. 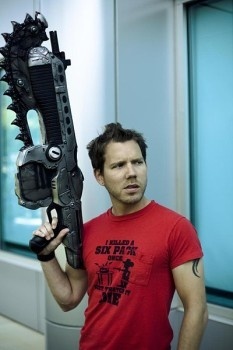 As Bleszinski himself lamented: "Rule #76: On any given day one of my tweets will appear as a very controversial headline on the game news aggregate site n4g.com." Behold, the perils of the modern age. The moment you're the developer of any popular game, anything you ever say in public can be used as a weapon against you. Must be a pain in the neck.